This past weekend I bottled a wine I made that I would like to call...Yellow. It's named after a Coldplay song, get it? 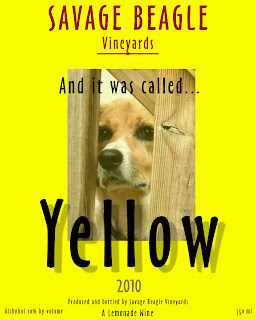 Yellow is a lemonade wine, based on a recipe posted by a fellow winemaker, Lon DePoppe, which he calls Skeeter Pee. While I think the name he chose was funny, I didn't think that many people would drink something called Skeeter Pee, so I named our version Yellow. I also modified the recipe, adding less sugar at the end, only sweetening it to my taste. I am happy with how the wine came out. It's an off-dry wine, with nice acid and lemonade-like feel. Don't confuse this with the hard lemonades you buy in the store. Those are malt carbonated beverages with only 5% alcohol. Yellow has no malt, isn't carbonated, and is 10% alcohol. It is very easy to drink, as it just tastes like lemonade. I did learn one valuable lesson making this wine. 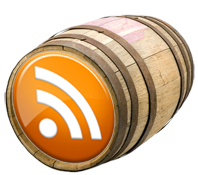 If you are going to filter a wine, always use a coarse or medium filter first, never move straight to the fine filter (or what they call sterile, it isn't sterile really, but it is close). Just before filtering the wine, I thought it looked cleared clear, so I decided to jump right to the end, to save time and filters. Even though the wine looked clear, it wasn't, cause the filters kept clogging up, and drove the PSI so high that wine was shooting everywhere. I lost about a gallon of it that way, very. Luckily this wine is cheap to make.